La fumée que vous voyez n'est pas due à des incendies. Il s'agit simplement de vapeurs provenant de sources naturelles d'eau chaude. Au Japon, ces sources sont très courantes et sont appelées onsens. En japonais, ça s'écrit 温泉 et signifie littéralement source (泉) chaude (温). Evidemment, les japonais ont tiré parti de ces sources pour créer des bains publics, qui portent également le nom de onsen par extension. Ici sont élevés des crocodiles, parfaitement adaptés au climat particulier de cet endroit. Le courant est tellement puissant qu'il peut déplacer, je cite, un wagon de train et demi. Et pour compléter toute visite à Beppu, il faut absolument aller tester les onsen de la ville! 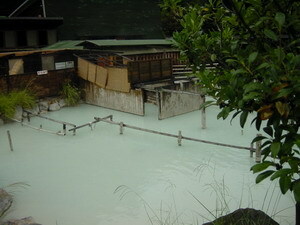 Global rating : With a huge amount of mud on the bottom of the baths - and in suspension, this onsen is absolutely unusual. It also contains lots of metals : 195 mg of iron and 107 mg of aluminium per kg of water. Size : There are two main outside mixed baths: the largest one... is really huge; however, the mud found on the bottom of it is not as sandy as the smaller bath, which is therefore often more crowded... There are other outside baths, too, but you probably will find them less interesting. Note the presence of a small sauna, where the presence of sulfurous vapors is surely going to limit the time you will spend inside there! View : Although in the nature, the quality of the overall view is significantly decreased.... since the onsen is almost under the bridge of a highway! (it is a little exaggerated, the bridge is not that close of the onsen, but it is still really disturbing). Modesty : There are separated changing rooms and segregated inside bath. Normally, you are not suppose to use a bath towel in the baths (what usually women do in konyoku). Since women can enter in the outside bath in a sheltered area, this should not be a problem: there is so much mud that a towel is really not necessary. 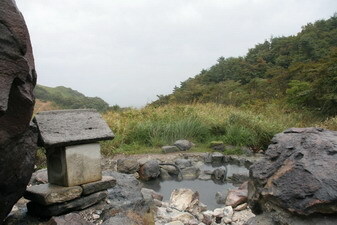 Global rating : Considered as a "secret onsen", this bath is quite isolated. You will need a car to reach it - and still there is a 10-15 minutes walk from the parking lot. As many hidden rotenburo, you might enjoy a lot this onsen if you are alone, but it could be quite unpleasant if other bathers are there, too. Anyway, the view itself is worth the short trip from Beppu. And print a map with the location of the bath, it is easy to get lost (if you can find the parking lot, you will find the bath). Size : Two very small baths, just ment to accommodate 1-2 persons each. View : A stunning view on the surroundings: the mountain on one side, and the forest on the other... and the town of Beppu, as well as the sea, can be seen if the weather is clear. Modesty : No changing room (obviously ! ), no place to hide, and not a lot of space to bath... However, chances are high that you will be alone there, so probably there is no reason to feel embarrassed. Global rating : This can't really be called an 'onsen', but since it is found in one of the most famous onsen town - and very related to it - we decided to add it here, too... 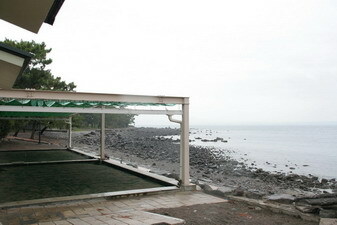 Here you can take a "sand bath": the sand is heated by the underground, so you a similar sensation as in a normal onsen! Size : The large, artificial rectangular shaped surface (20 x 6 meters) is filled with sand - and covered to protected you from sun... or rain. Modesty : No problem: clothes are used!